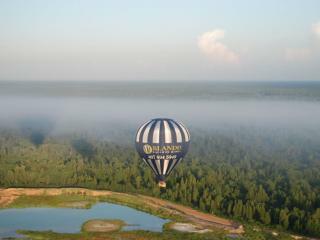 For the ultimate in panoramic views, take to the skies with an Orlando Balloon flight. See Florida attractions from a bird’s eye view …the best seat in the house! Orlando Balloon Flight Tickets offers an exhilarating experience as you fly over beautiful landscapes and lakes and absorb the amazing tranquillity of the morning sunrise. Meet one hour prior to Sunrise at the departure location detailed on your voucher. All passengers are invited to join in the inflation process as your balloon comes to life. Then experience the excitment of take off and soak-up as you soar high above the ground. Depending on the wind and landing sites, this amazing experience lasts for around an hour and whether you are gliding over lakes and treetops or rising to several thousand feet, the balloon is wonderfully calm as it floats gently in the wind. Each flight is totally unique as the route and landing site are completely dependent on the wind strength and direction. No two flights are ever the same. Once on the ground, share in the oldest of ballooning traditions, a champagne toast, and revel in the peace, tranquility and beauty that you never knew existed. Tickets include 60-minute Hot Air Balloon Ride, amazing sunrise views over Orlando, services of a fully licensed and certified FAA Pilot, Champagne toast and light snacks upon landing. Meet one hour prior to Sunrise at the Orlando Balloon Rides Welcome Center,44294 US Highway 27 Davenport, FL. 33897. Hotel pick-up is not included in the price, but if you do not have your own transport in Orlando, transfers can be arranged locally with the balloon company upon reconfirmation for approximately $10 per person. Balloon Capacity ranges from 4 to 24 adults. The larger balloons are compartmentalized for increased passenger comfort and safety.